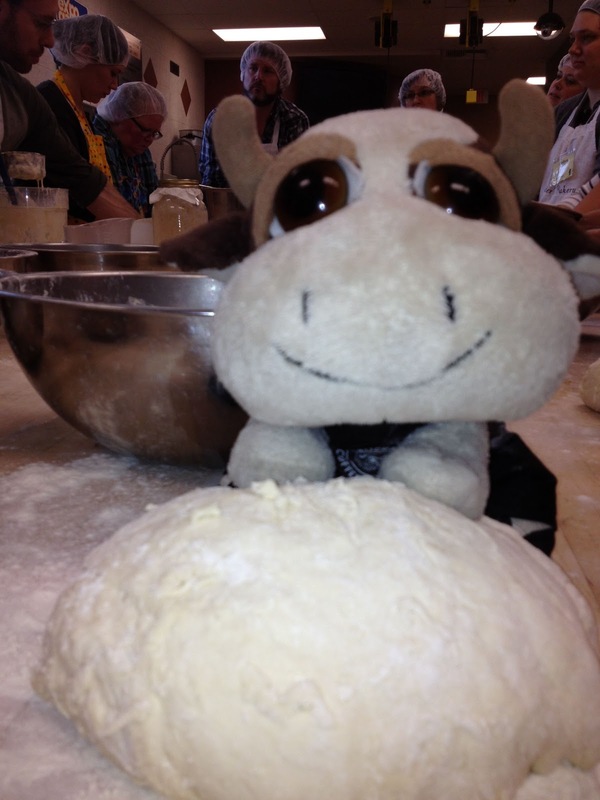 Mr. Moo's Adventures: Eat Alberta - A Fun Way to Learn About Food! The day started off with coffee and a continental breakfast, giving participants a chance to catch up with old friends or introduce themselves in person to Twitter friends. Next came a very informative keynote speech to start the day by Shannon and Danny Ruzicka from Nature's Green Acres, who spoke about their experiences about raising grass fed livestock. After which, everyone began a very busy day of sessions! I began my day with Artisan Cheese Making where we were tackling a 30 minute mozzarella recipe, a cheese I'd recently failed at making. Under the the watchful eye of Chef Alan Roote, an instructor at NAIT, we began to tackle the finicky world of making cheese. This involves adding citric acid to 4 litres of milk, then warming it up on the stove while stirring constantly. Once it reached temperature, it was removed from the heat and the rennet added, some more stirring then waiting until it has started to solidify and is jiggly. Then the curd mass is cut, more waiting, more warming, before it's finally strained, nuked in the microwave, seasoned, nuked some more and shaped. Unfortunately for Moo, my milk didn't solidify, and although Chef Roote was able to save it, it didn't set in time for it to be finished. Thankfully the male humans' cheese did work out and we left with one mozzarella ball. Next up was Cut Like a Chef: Knife Skills with Kevin Kent, owner of Knifewear, located in Inglewood in #yyc. Although I was a bit daunted going into the class, Kevin is amazingly funny and quickly puts people at ease with humor. 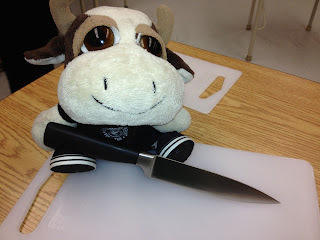 Although holding a knife like a chef feels incredibly awkward at first - thumb on one side of the blade, forefinger on the other, the rest of the fingers wrapped around the handle - once one got used to it, it was definitely a more controlled way to hold a knife than your hand just wrapped around the handle. We learned to slice potatoes thin, to julienne, to dice onions, and cut carrots obliquely - which is when Kevin walked around looking at everyone's work and told @CynthiaStrawson she wasn't cutting obscenely enough. 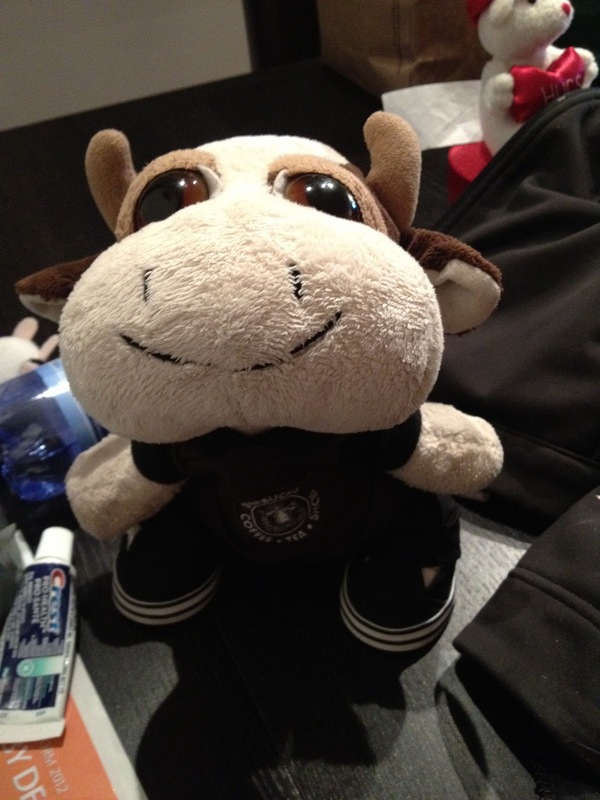 Moohahahha.... He even demonstrated how to flute a mushroom, cut a pineapple, and an orange without losing all the juices. 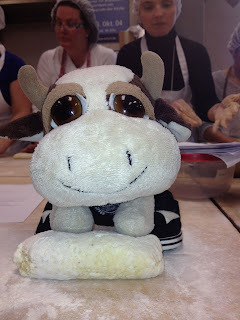 After this morning's cheese failure, this class invigorated The Moo for the afternoon classes. After a delicious lunch of soup and sandwiches, created by the Culinary Arts students at NAIT, we were onto our afternoon courses. First up was Gnocchi Making 101 with Kathryn Joel of Get Cooking. I'd taken a Get Cooking Indian class with her previously, with Michelle Peters-Jones at the helm and really enjoyed it. Personable, talkative, informative, and fun, Kathryn always makes cooking a good time. 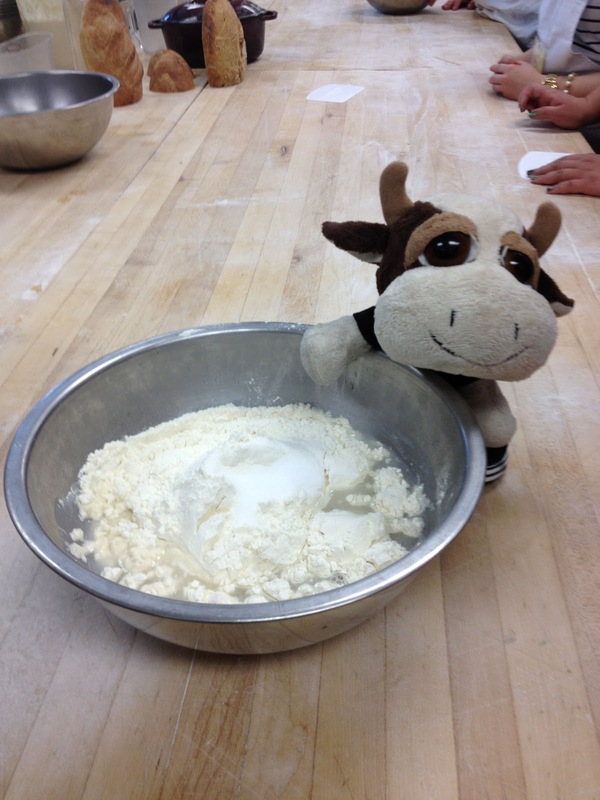 Today we were learning to make ricotta gnocchi, with the house made ricotta provided by Chef Alan Roote. The recipe was incredibly simple, ricotta, add parmesan, egg yolks, garlic, salt, pepper and freshly grated nutmeg. Mix it all together with your hands, roll it into a sausage shape, cut into 1 inch diagonal pieces and chill prior to cooking. Cooking basically involves putting them into a pot of boiling water until they float to the top and voila, fluffy, light, soft gnocchi! We all got to leave with a container filled with gnocchi we'd made, ready to be cooked later. To end the day was Sourdough 101: Basic Yeast Farming with Owen Petersen of Prairie Mill Bread Co. The class was probably one of the funniest I'd had all day, a great way to end the conference! We learned about starters - Owen had named his Julie - how to take care of it, feed it, keep it alive and use it. Everyone got a little baggie full of Julie to take home with them so we could make more sourdough, as well as Owen's blessing to rename her as she grows, matures and morphs into a different beast under our individual care. The sourdough was amazingly easy to make, consisting of 1 cup of Julie, 2 cups of water, 4 cups of flour and 1 tablespoon of salt. We spent the majority of our time mixing it together until it held together enough to flip onto the table and knead. Once the dough was kneaded until it was smooth, we wrapped the dough up loosely with plastic wrap to take home, which would be ready to bake the next day. To finish it the next day, we had to take it out of the fridge, let it reach room temperature/rise, knead some more and shape it, let it rise again, then score it. Take your dutch over, or in lieu of, a bread pan, and warm it in a 500F oven, line the bottom with wrinkled parchment paper, put the dough in, spritz with water, put a lid or tin foil on it, then bake for 20 minutes at 500F. Then remove the lid and reduce the heat to 350-400F and bake for another 40 minutes and voila, sourdough! The day ended with a panel discussion led by Alan Suddaby, with Kevin Kossowan, Jeff Senger, Amy Beaith and Shannon Ruzicka about "How to Survive a Zombie Apocalypse", which more or less meant how to live sustainably off the land by growing your own produce, making it last through the winter, and other strategies. 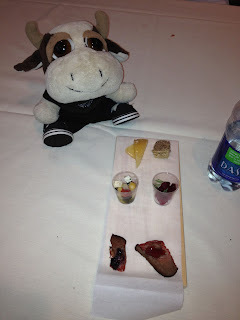 We then convened to Ernest's Dining Room for the "Wine Down", where we got a tasting board of cheese and meats put together by Alan Suddaby, as well as some local wines to taste. It would be nice if the hands on sessions were a bit longer, lengthened to 1 1/2 hours to 2 hours each. This would allow for students to make mistakes, ask lots of questions, and feel less rushed. Many presenters commented that they could have used more time. Perhaps there is potential for this to become a 2 day weekend conference to accommodate longer sessions, with 2 sessions per day instead of 4. Building a 1/2 hour break between sessions instead of 15 minutes would also be useful for presenters as I'd heard many felt that they didn't have enough time to clean up afterwards or set up before. Overall it was a fun and food filled, albeit a little bit tiring day! I look forward to Eat Alberta 2013! thanks for the summary - even tho i was there, never got to observe an entire session - so this is a nice read to see how it felt from the participants side of things. your photo's are great, and i see mr moo was a very busy bovine! thanks for coming, and thanks too for the suggestions for next year. i do believe that a participant survey should hit the humans inbox within days - feedback is always welcome and appreciated. Thanks for reading Su! I hope I'll get to meet you at some point in the near future! i completely agree with longer sessions and perhaps even a 2day conference! It would definitely draw in more people from around Alberta, as opposed to just coming in for 1 day. Hope you enjoyed your EatAlbert goodies! You were in my classes?!?! I wanted to meet you! Hopefully we will cross paths again soon! And yes, definitely enjoying my goodies! Hope you are too! Glad you enjoyed my post and apron! It was a lot of fun! I agree, not everyone will be happy an $270 might be cost prohibitive, but depending on what costs need to be covered - as I'm assuming the conference is cost recovery, This Moo can think of a few ways to get them covered via sponsorship and other creative fundraising means. As well as recruiting more volunteers. Looking forward to filling out the survey! Fantastic recap! Between your post and Deb's, I totally want to try making some cheese! I might take you up on that offer for some reenet!